5 x pure Shungite Crystal pendants This is a pure Shungite Circular Crystal pendant with an attached clearing and energising Quantohm Orgone micro. Good for raising vibration and clearing negative energies and emfs. Do not get wet as it will lose its shine. Approx 3cm in diameter. This pendant will keep itself clear. All pendants come with a large clearing Quantohm Orgone base to rest in at night for added clearing and amplification. 10 x pure Shungite Crystal pendants This is a pure Shungite Circular Crystal pendant with an attached clearing and energising Quantohm Orgone micro. Good for raising vibration and clearing negative energies and emfs. Do not get wet as it will lose its shine. Approx 3cm in diameter. This pendant will keep itself clear. All pendants come with a large clearing Quantohm Orgone base to rest in at night for added clearing and amplification. 20 x pure Shungite pendants.This is a pure Shungite Circular Crystal pendant with an attached clearing and energising Quantohm Orgone micro. Good for raising vibration and clearing negative energies and emfs. Do not get wet as it will lose its shine. Approx 3cm in diameter. This pendant will keep itself clear. 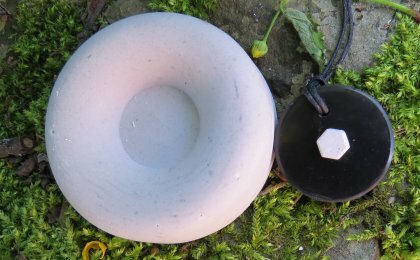 All pendants come with a large clearing Quantohm Orgone base to rest in at night for added clearing and amplification.